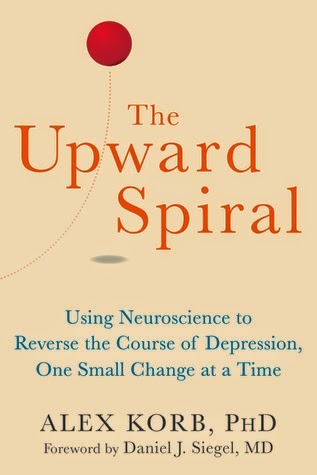 Neuroscientist Alex Korb has written an interesting book about depression called The upward spiral. A core idea in his book is that depression is not simply a state in which you feel badly but rather a downward spiral. What he means by this is that while you feel depressed you are inclined to do things which do not relieve your depression but maintain or aggravate it. Things such as physical activity, social contact, and thinking about happy memories, among other things, might help but are precisely the type of things which you are not inclined to do when you feel depressed. Because of this, it is easy to get stuck in a depressed mood. Korb speaks in a pleasantly normalizing tone about depression. He explains that there is generally nothing wrong with the brains of depressed people. Instead, he says there is usually just a deficient communication or tuning between different neural circuits. He uses the metaphor of a microphone and a speaker. When the microphone is held too closely to the speaker an irritating high pitch tone sounds. This does not happen because there is something wrong with either the microphone or the speaker but because of the interaction between the two. Korb deals in detail with which neural circuits play the most important roles, namely (1) the prefrontal cortex (which is, to put it simply, the thinking brain), (2) the limbic system (the 'feeling brain'), (3) the striatum (which regulates impulsive behavior and habitual behavior), and (4) the insula (which plays an important role in pain perception). Especially the cooperation between the prefrontal cortex and the limbic system is often not working well. Briefly, the prefrontal cortex plays an important role in regulating fear and negativity. When the prefrontal cortex is less active this regulation does not function well and you will fall prey more easily to depression and fear. In addition to describing these structures in the brain Korb also explains a lot about neurotransmitters (chemicals which help with the transmission of signals from one neuron to another) which play an important role in depression such as serotonin, norepinephrine, dopamine, melatonin, oxytocin, and endorphins. An important message in the book is that the downward spiral of depression can often be bent upwards relatively easily. In the same way that a depressed state can maintain itself (see my explanation above) a non-depressed state can maintain itself. When you take a small step on the upward spiral it becomes just a little easier to take another step upward. An example: when you go for a walk of half an hour, serotonin is produced in your brain. This substance stimulates the working of the prefrontal cortex and benefit you willpower, motivation and mood. Also, through physical activity, other neurotransmitters are produced such as norepinephrine en endorphins. This substances trigger various positive effects in your mood and your functioning which help you forward. In different parts of the book Korb acknowledges that medication, psychotherapy, and other approaches, such as deep brain stimulation may help to alleviate depression. But he emphasizes how you can often achieve similar positive effects through your own behavior. Some of the examples of these helpful behaviors are: intensive aerobic physical exercise, social contact, physical touch, thinking of happy memories, planning your response to stressful events, setting long-term goals, improving the quality of your sleep, exposing yourself to sunlight, expressing gratitude, etcetera. Conclusion: an informative, interesting and useful book for anyone who is sometimes troubled by a depressed mood and does not feel like visiting a psychotherapist or taking medication.